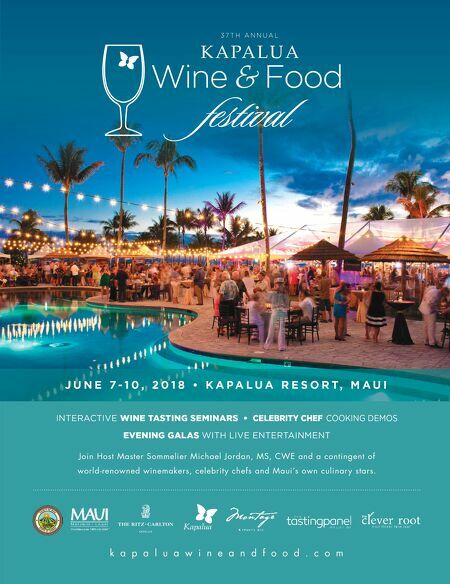 28 / the tasting panel / december 2017 SIN CITY SIPS N ectaly Mendoza has been busy of late. Unbeknownst to most, the Herbs & Rye proprietor spent much of last year searching for the perfect space for a sophomore concept. Slated to open in spring 2018, Cleaver Butchered Meats, Seafood & Cocktails will be a classic Las Vegas–style steakhouse and cocktail bar located just east of the Strip. In late September, just a day after I was finally able to break the good news about Cleaver, I joined Mendoza and Herbs & Rye Beverage Director Gerardo "G" De La Torre as they traveled to South Korea for the inaugural Barmania Seoul bartending competition. 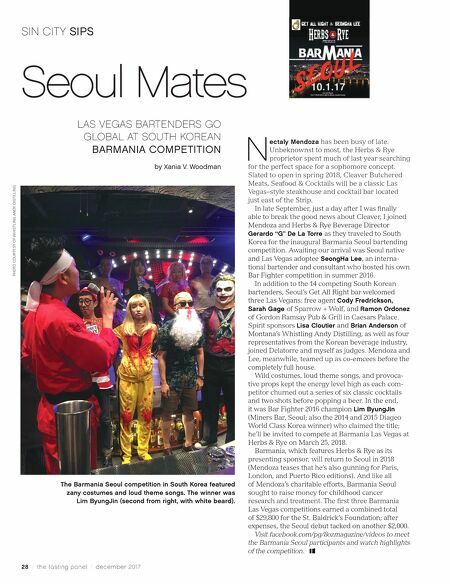 Awaiting our arrival was Seoul native and Las Vegas adoptee SeongHa Lee, an interna- tional bartender and consultant who hosted his own Bar Fighter competition in summer 2016. In addition to the 14 competing South Korean bartenders, Seoul's Get All Right bar welcomed three Las Vegans: free agent Cody Fredrickson, Sarah Gage of Sparrow + Wolf, and Ramon Ordonez of Gordon Ramsay Pub & Grill in Caesars Palace. Spirit sponsors Lisa Cloutier and Brian Anderson of Montana's Whistling Andy Distilling, as well as four representatives from the Korean beverage industry, joined Delatorre and myself as judges. Mendoza and Lee, meanwhile, teamed up as co-emcees before the completely full house. Wild costumes, loud theme songs, and provoca- tive props kept the energy level high as each com- petitor churned out a series of six classic cocktails and two shots before popping a beer. In the end, it was Bar Fighter 2016 champion Lim ByungJin (Miners Bar, Seoul; also the 2014 and 2015 Diageo World Class Korea winner) who claimed the title; he'll be invited to compete at Barmania Las Vegas at Herbs & Rye on March 25, 2018. Barmania, which features Herbs & Rye as its presenting sponsor, will return to Seoul in 2018 (Mendoza teases that he's also gunning for Paris, London, and Puerto Rico editions). And like all of Mendoza's charitable efforts, Barmania Seoul sought to raise money for childhood cancer research and treatment. The first three Barmania Las Vegas competitions earned a combined total of $29,800 for the St. Baldrick's Foundation; after expenses, the Seoul debut tacked on another $2,000. Visit facebook.com/pg/8ozmagazine/videos to meet the Barmania Seoul participants and watch highlights of the competition. PHOTO COURTESY OF WHISTLING ANDY DISTILLING LAS VEGAS BARTENDERS GO GLOBAL AT SOUTH KOREAN BARMANIA COMPETITION by Xania V. Woodman Seoul Mates The Barmania Seoul competition in South Korea featured zany costumes and loud theme songs. The winner was Lim ByungJin (second from right, with white beard).